Newsletters, yay or nay? I get tons of scrap related email and newsletters every day. I love some and some drive me away screaming! When I check my email inbox I’m often surprised at the sheer volume that have been delivered overnight. This is what I’ve learned from this vast assortment. They are not all created equal. I don’t like to be bombarded with too much information in one newsletter. Just keep it clean and interesting. I don’t like newsletters that are pages and pages of ads! Especially those ads that look like business cards two or three columns wide. Stop! That’s information overload! I like freebies but many of my favorite newsletters don’t give freebies and it doesn’t matter. No freebie is fine with me if the content is great. If there is a freebie, I hope it’s good quality. Nothing is more frustrating than making a layout and paying to get it printed only to receive poor quality prints. Some people believe they don’t have anything news worthy to say and it shows. I don’t think all stores or designers have to have a newsletter but if you decide to do it, please do it right! I’m sure it takes a lot of work to put together a good newsletter. It probably takes quite a bit of work to put out a bad newsletter too. All this to say, focus on doing the things you enjoy and that you’re good at. If you’re not so great but you love it, then keep working at it. Find a group of like minded ladies that will help, challenge and encourage you. And have fun, you will get better fast! This entry was posted in Just Sayin' on August 18, 2013 by Yobeth. Why do you scrapbook? A designer recently posted this question on her Facebook page. I was never a big paper scrapper. 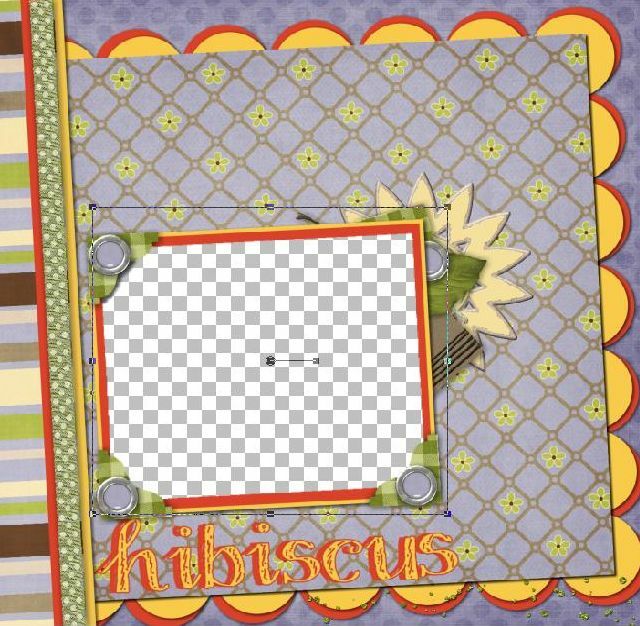 Actually I’ve only completed one paper scrapbook and I have an unfinished one but then I found digital scrapping and I’ve been hooked ever since. I found digital scrapping out of necessity. I wanted to make a “party favor” of sorts for all the family members that attended our first family reunion without spending a lot of money. I had thought about making a Power Point presentation but that really wasn’t what I was looking for and making a paper scrapbook for everyone was just too expensive. After doing some online research I found MyMemories Suite scrapbooking software. It was perfect and so easy, there was a very small learning curve. I was able to put together a lovely memory “book” for everyone which I set to music and burned to DVD. It was really a family history of sorts. The idea for a family reunion came about after my brother’s funeral. Our family is spread across two states and the only time we’d all get together was for funerals! The older generation were already passing, in the previous decade we’d lost my father and my older brother. My son, niece and two nephews really worked at making all the plans for a reunion. The cousins, as we call them, have really made an effort to keep in contact and remain close even though they’re separated by many miles. So the DVD was much more than a reunion memory, it was a family heritage keepsake. I collected old photos and tried to show highlights of ours lives as we grew up and had families of our own and they had families of their own too. It brought back lovely memories and made everyone laugh and cry. In the process, I became hooked on digital scrapping and found a community of people that share my love for scrapping. We love our families and want to pass on some of our cherished memories. We are our families memory keepers. What about you? Why do you scrapbook? This entry was posted in Family, Just Sayin', MyMemories on August 17, 2013 by Yobeth. Yesterday the word of the day was kaleidoscope on Digi Scrapping Divas Facebook page. This month we’ve focused more on techniques and effects for inspiration. I think it’s a fun twist on the daily challenges. It is very curious how bright colors are unrecognizable once the kaleidoscope effect is applied. 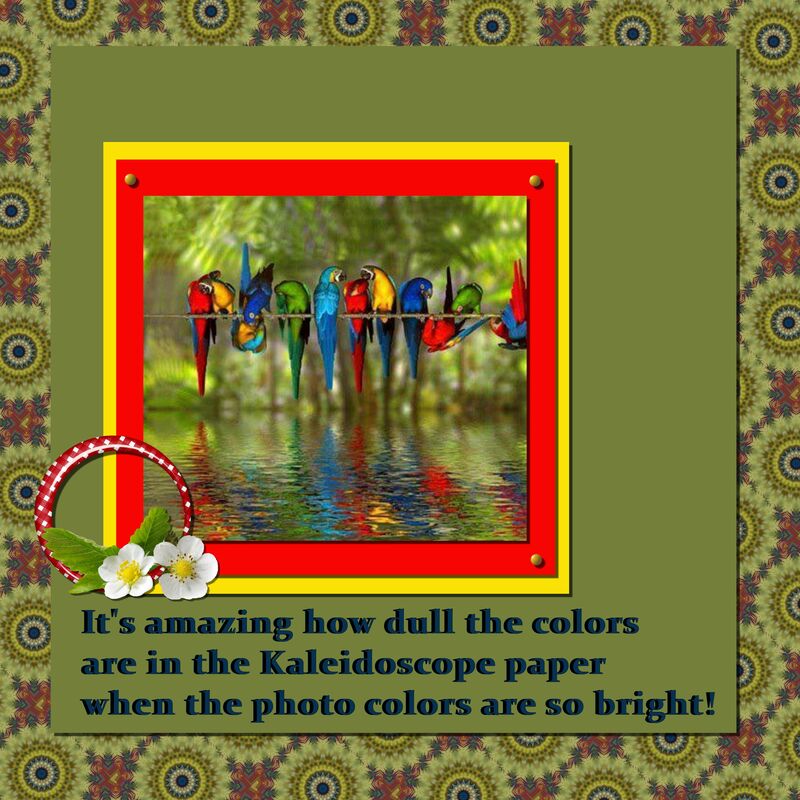 In the example below, I used the bright bird picture to make the kaleidoscope background paper which turned out so different you’d never guess what the source was. This entry was posted in Challenges, DigiScrappingDivas, Paintshop Pages, Techniques on August 14, 2013 by Yobeth. A blog subscription is now available for Kindles. Would you like to stay up-to-date on all my blog posts? Good news! You can now subscribe and have new material sent directly to your Kindle. Subscribe here. Need a Kindle? Click the image below to purchase Kindle Fire HD 8.9″ from Amazon. This entry was posted in Announcements and tagged blog subscription, kindle, kindle blog, subscribe to blog posts on August 9, 2013 by Yobeth. Wouldn’t you love to know how to cut out letters or shapes when you’re scrapbooking. I’ll show you how easy it is to make those cut outs and you won’t need expensive photo editing software to do it. That’s right, it’s easy and free! Here’s an example of what I’m talking about. You’ll find the tutorial here. This entry was posted in MyMemories, Techniques, Tutorial and tagged cut outs, cutout, how to make cut outs scrapbooking, Scrapbook, tutorial on August 8, 2013 by Yobeth. Here’s a question I hear a lot, “How do you make your own quickpage?”. It’s easier than you think. Even better, it’s free! Yes, that right, there is a free online tool that let’s you easily change your layout into a quickpage (QP) fast. If you would like to learn how to do it, hop on over to my short tutorial here. You’ll end up with a layout that has a transparent area. Then just add your photo. Rotate your photo as needed to fit the hole then send your photo back so that it will be behind the quickpage. You can then add your title, text or anything else you’d like to the QP. This entry was posted in Techniques, Tutorial and tagged free, how to make a quickpage, QP, tutorial on August 7, 2013 by Yobeth. What makes a good album cover for the scrapbook you’re making of your honeymoon or family vacation? I think using one of the photos from your trip works perfectly. You can add a smaller photo of the happy couple or family, depending on the occasion, to further personalize the album. If you’re using MyMemories Suite it’s easy to make a title using the same photo that you used for the background. There is no need for any additional embellishments. In the end you’ll have a cover that looks professionally designed. 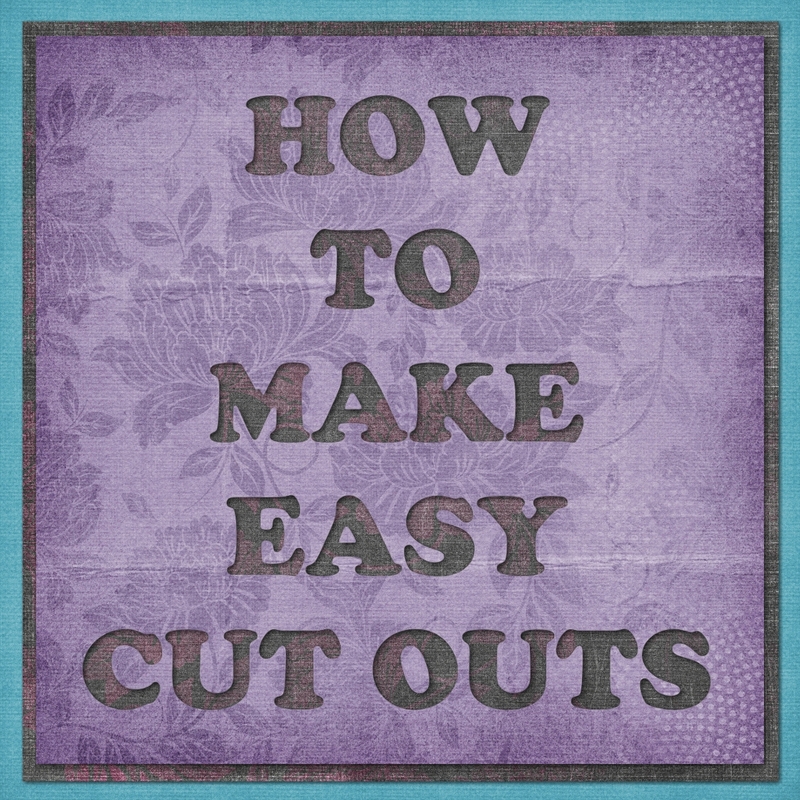 If you’d like to find out how to make an album cover like this check out this short tutorial. This entry was posted in DigiScrappingTips, MyMemories, Techniques, Tip, Tutorial on August 6, 2013 by Yobeth.